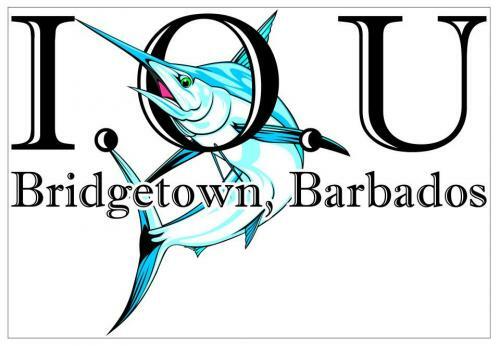 IOU Fishing Charters operates out of Bridgetown, Barbados, running offshore fishing trips aboard two great vessels, the IOU and the Shooter. 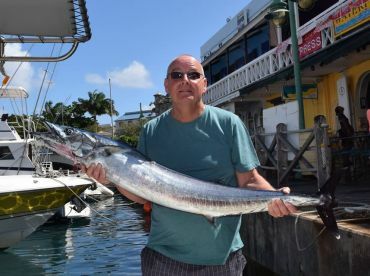 Working with experienced captains and attentive crews, they will work with you to build the perfect fishing trip, whether you are a complete beginner or a seasoned pro. 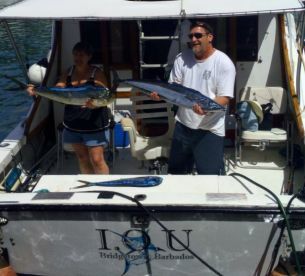 Owned by Alan and Nicola Birkett, they have over 30 years of experience, fishing in big tournaments such as Barbados Game Fishing Association International Tournament and others. Fishing has been great recently! I booked this fishing trip knowing it was the poorest part of the season for catching fish, so I didn’t really expect to catch anything. Turns out, we were the only boat out that morning that did catch something. We caught a Barracuda that fed 5 of us that night. I’m sure during the good part of the season we would have been catching our fill of fish. Capt. Omar was friendly, and explained how we would fish for the day. 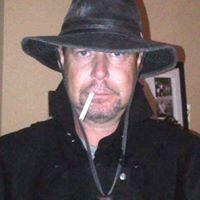 He and his #1 were about their business at hand, and were not trying to entertain us. . . which is a good thing. The #1 kept the bait in the water, even in the driving rain squalls. Not much to do during the down time which we had plenty of, but I did go up to the bridge and chat with the Capt. for a while. He answered a lot of my questions about the boat, fishing and the island. The boat was an older boat, but clean and well equipped. Capt. 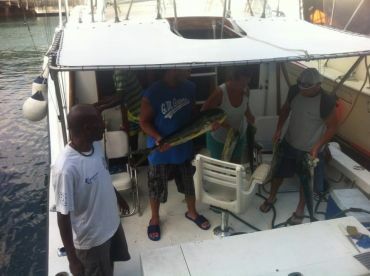 Omar cleaned and de-boned our Barracuda, and we were on our way with the main course for dinner. The cab was on time to pick us up at our villa, and he was there on time to take us back. I paid for a 4 hour trip, and got a 4 hour trip with EVERY opportunity for fish to bite the hook. Though I wasn’t expecting much because of the off-season fishing, I was excited to bring home dinner. The ONLY negative thing I could say, was there was no Safety Briefing. No info on where life vests were, or any emergency procedures. I felt as we were in good hands, and was not worried. But, before any trip like that, I feel there should be a safety briefing. Of all the boats I saw going out, I wouldn’t want to be on another one. 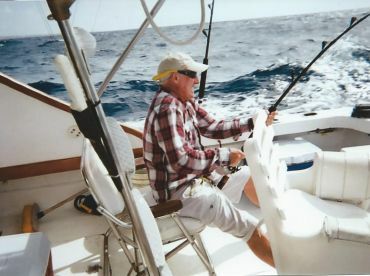 I HIGHLY recommend IOU Fishing with Capt. Omar. I’m sure I got my money’s worth! ! ! Hi John, thanks so much for your lovely review. We hope to see you again and that the weather and fishing is better next time. 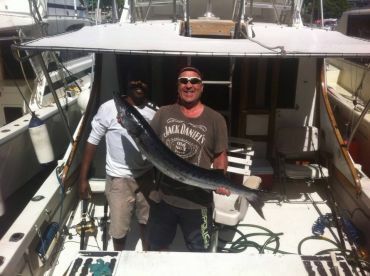 Enjoyed our hail-day fishing charter with IOU. 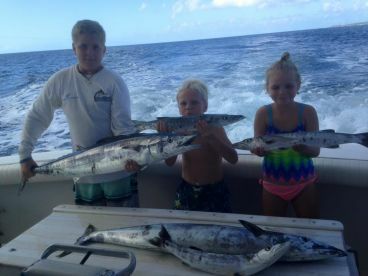 We are not experienced fishermen, but my wife and younger daughter landed wahoo. Dinner with fish caught two hours earlier was awesome. The captain and crew were efficient and friendly. All in all, a fine experience. We were picked up punctually from our guest house and delivered to the boat at the Careenage. There, we were met by Alan and he introduced us to Omar and Vincent. We cruised up the West Coast trolling for fish. 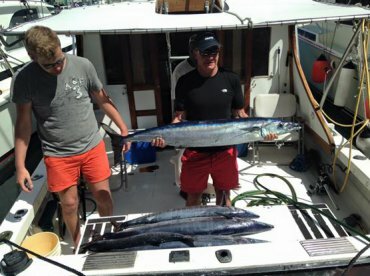 We caught a large Wahoo which put up a really good fight! We were hoping for barracuda (it was on our menu list), and though we had several bites, they decided not to get hooked. 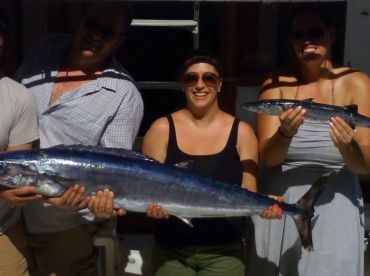 However, the Wahoo made up for it. Lizard was a great crew member, right on top of things when needed. 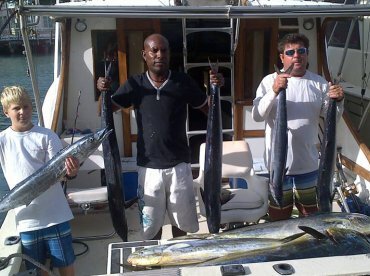 He and Omar were well coordinated when re-baiting lines or assisting us bringing in the Wahoo. While the boat is older, it performed well and did the job (we were there to fish, not be on a cruise ship). Snacks and drinks were in ample supply and on our return Omar did an exceptional job in filleting the Wahoo (which we took back and enjoyed for dinner the next two nights). All in all, well worth the cost and experience of fishing for game fish. We will use IOU again, for sure. Thanks so much for fishing with us and for the great review. We look forward to seeing you again and will do our best to get that barracuda for you next time.